When did today dawn in Russia? Not an easy question for a country with so many time zones, but it’s even worse if you’re a historian. For historians, ‘today’ means ‘contemporary history’, but today might stretch for a century. Historians talk about the ancient, medieval, early-modern and modern pasts. Each has its own character and its own justification for occupying a corner of the historical profession. One of them — the early modern — no doubt bamboozles the uninitiated, but its reason for existing (see here) is plain. And then there is the contemporary. It’s our time, but no one agrees on when it begins or when it ends. Let alone in Russia. It would be nice to think that ‘our time’ means something readily comprehensible like ‘living memory’ or ‘the timespan of family lore’, but that would assume we’re all the same age or have similar families. Historians must stand back and think more generally, reflecting on when a set of characteristics came into being that we can easily associate with how people live now. Plainly this depends on where you are standing in the world, but for Western Europe, at least, one can make a case for any time since the late nineteenth century. In Russia, meanwhile, you might be forgiven for thinking that contemporary history begins in the sixteenth century, if you believe for a moment the Moscow correspondents who maintain that Vladimir Putin and Ivan the Terrible are really the same man. In those unlucky countries where history is lived rather than studied, the dating of the contemporary assumes a fiercely political edge. 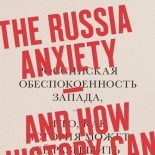 Does contemporary Russia begin in the late imperial period, or was that washed away in the torrent of 1917? Does it stretch from Stalin to today in one unbroken line? Did the reforms of Gorbachev create the basis of a possible post-Communist democracy, or did they mark the perfect continuity between Soviet and post-Soviet corruption? Historians spend futile hours debating with each other such alternative periodizations. But when Russians rehearse the alternative start and end points of ‘our age’ in their daily lives, when one day looks like 1945 and the next like 1956, they must be experiencing a stress that is absent from the eternal present of luckier places. This entry was posted on October 31, 2014 by beyondthekremlin in Russia past and present and tagged historians, Russia today, Soviet life.